Home » Blog » Quick Q&A: when should Penn State honor JoePa? 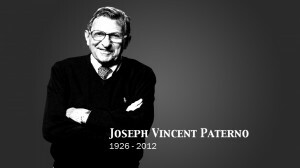 In your opinion, is there an appropriate time to honor Joe Paterno’s 61 years of service to Penn State? Why/why not? Thanks for the question about when/if to honor Joe. A year after his death, it tops the list of alumni complaints. It is also one of the most polarizing issues Penn State continues to face. After reading Posnanski’s book, the Freeh report, a good chunk of the Sandusky trial testimony and pretty much every other news story about Penn State since November 2011, I am convinced that he was unaware of the extent of Sandusky’s crimes, and played no role in any alleged cover-up. With that said, I believe it is only prudent to wait for an extended period of time before honoring Joe. By all accounts, Joe led a life of integrity and challenged others to do the same. We know that. But the reset of world believes a different story that was concocted by a sensationalistic media horde. The story we know will become much more clear when Curley, Schultz and McQueary finally tell their sides. Unfortunately, with the difficult legal issues yet to be meted out in court, that could take years. I realize this is a difficult and unpopular tack for many Penn Staters, but believe me, he will be honored as soon as possible. Meanwhile, there are many questions yet to be answered about the roles Penn State leaders played. I’m focused on trying to bring those answers to light.